Millions of Americans are financially vulnerable and without life insurance… but why? Bestow ran a national survey recently and uncovered what’s keeping individuals from buying life insurance. What’s interesting is people are well intentioned. They really want to protect their families, but they just assume it’s too time consuming and expensive. They also said they would be more likely to buy life insurance if they were given the ability to buy online, get an affordable price, and the skip the medical exam altogether. But before we talk numbers, here’s a little background on our survey. We surveyed 1,123 people across the country and focused on those who stated that they did not have an individual life insurance policy. Must not have an individual life insurance policy. We’ll use the term “coverage gap” throughout this article. This is referring to Americans who don’t own an individual life insurance policy. Now that we got that out of the way, let’s take a look at the findings. Why Don’t Americans Have Life Insurance? The biggest reason for the coverage gap is the lack of affordable options. 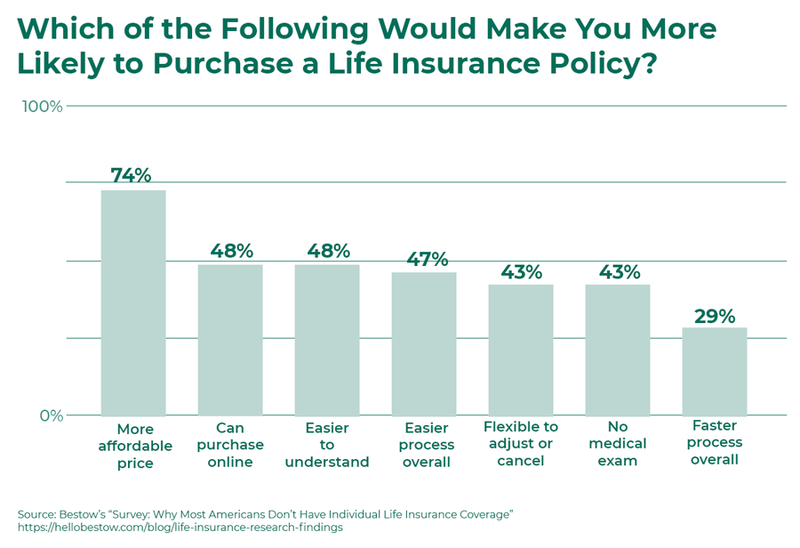 74% said more affordable policies would make them more likely to purchase a life insurance policy. This is consistent with other studies about consumer shopping behavior. A 2016 Pew Research study found that 79% of American consumers shop online now, either on the web or on their phone. And the biggest motivator for this isn’t so much convenience; it’s cost. The traditional way of buying life insurance comes with a lot of red tape: It’s offline, meaning you need to work with an agent, fill out many pages of paperwork, get examined by a doctor, get lab tests done… the list goes on. Not only is it invasive, it takes several weeks to even get a rate. This certainly doesn’t align with the modern consumer. In order to make life insurance available to buy online, we need to rethink the medical exam. 62% of Americans said no medical exam should be required. Invasion of privacy was the most cited reason, followed by a concern about failing and being denied coverage. Today, for the majority of Americans, there really isn’t a need for a medical exam. Big data and technology (like accelerated underwriting) eliminate the medical exam and remove the unnecessary middlemen that go along with it. And when you remove the obstacles, life insurance coverage becomes more affordable and convenient. 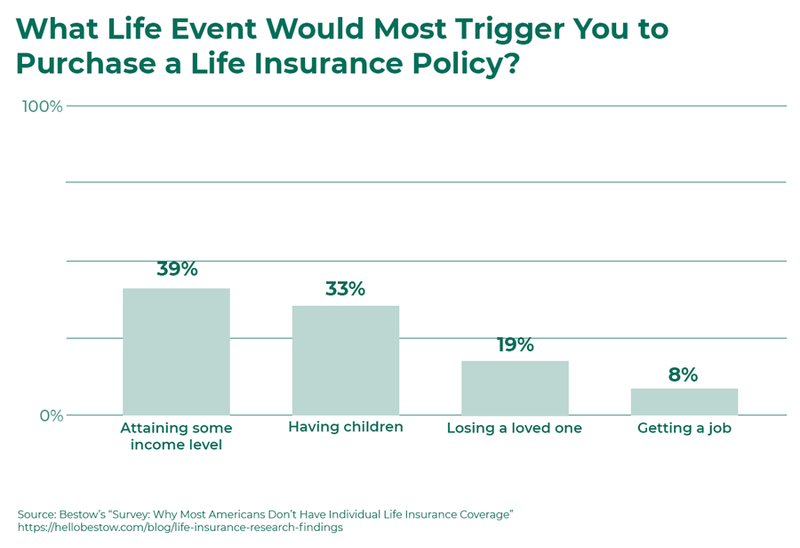 58% said they can’t afford life insurance. 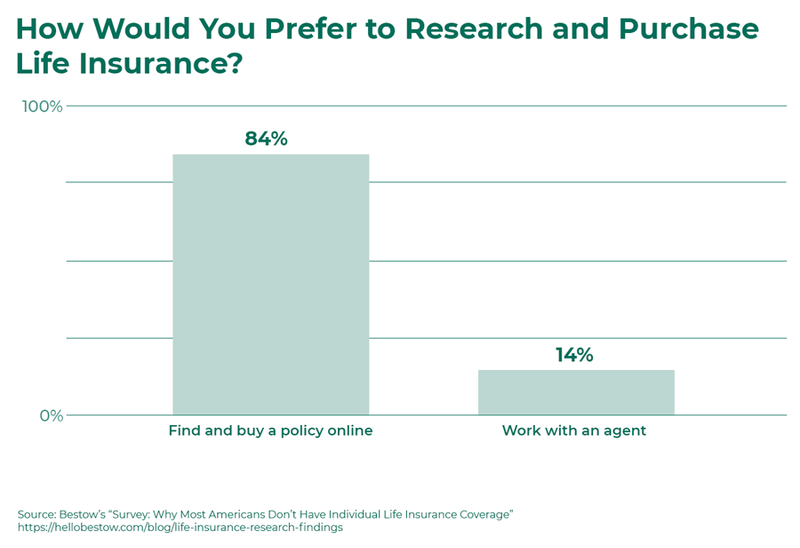 43% said having to work with an agent has contributed to their not having a life insurance policy. 35% don’t understand the benefits of life insurance. 24% don’t know their policy options or how to purchase. 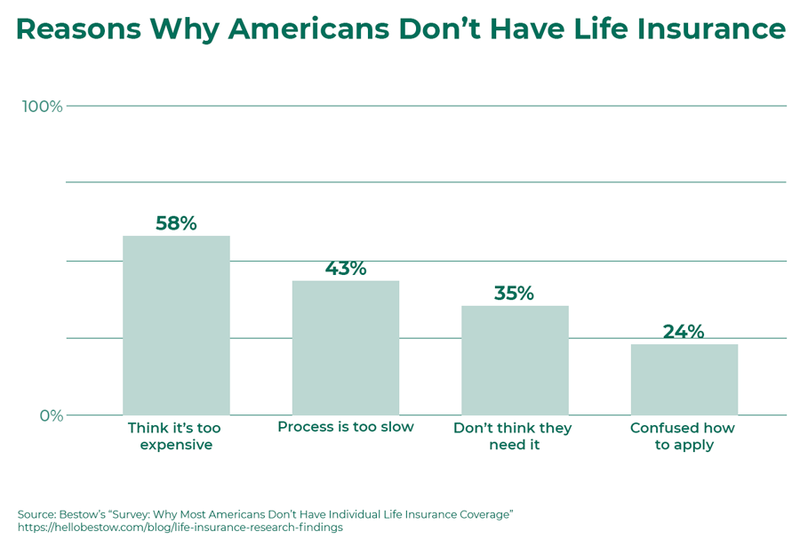 Why Do Americans Want Life Insurance? The majority understand that having life insurance is good, with 78% agreeing that life insurance would provide them with more confidence to live life knowing that their families are protected. 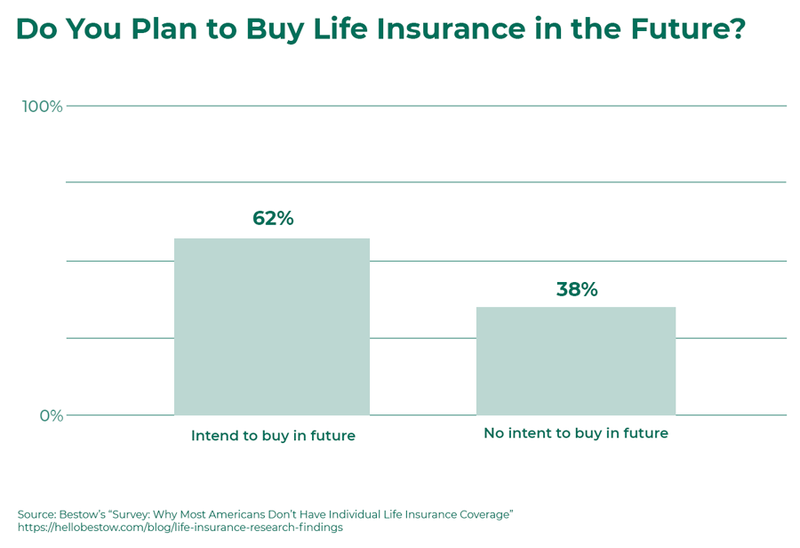 62% said they plan on buying life insurance in the future. 1 in 4 said they’re healthy and don’t feel the need for life insurance at this time. Men (38%) are more than twice as likely to cite this as a reason for not having coverage today, versus 16% of women. We think it’s awesome to have a “glass half full” outlook on life, but in this case, you might want to think like a scout and be prepared. What Life Event Would Most Trigger You to Purchase a Life Insurance Policy? 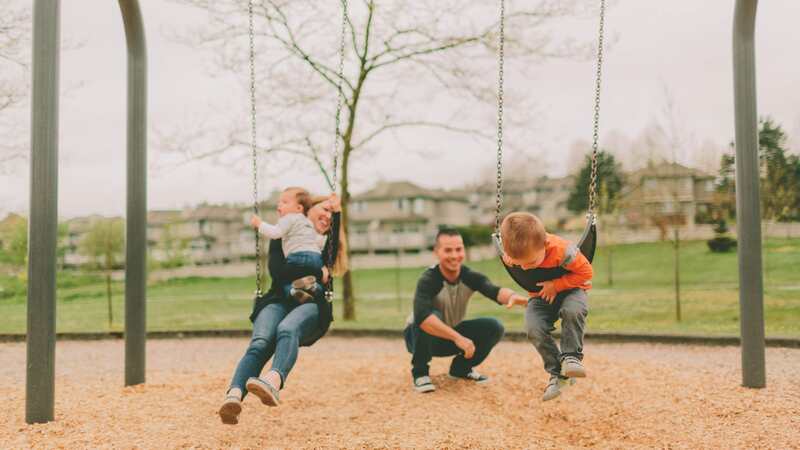 Significant life events, such as having children or losing a loved one, don’t necessarily trigger purchasing a life insurance policy like one would assume. Although Americans don’t have individual life insurance policies, we found that 29% do have group life insurance. However, many of those in the coverage gap had other assets and debt. More than half do not have a 401(k) or emergency savings. These numbers aren’t actually that surprising — only 32% of Americans have a 401(k) and only 39% can cover $1,000 in unexpected expenses with savings. 71% of those in the coverage gap have some sort of debt. A 2015 Pew Charitable Trusts study found that 80% of all Americans have debt, so this number also isn’t too surprising. 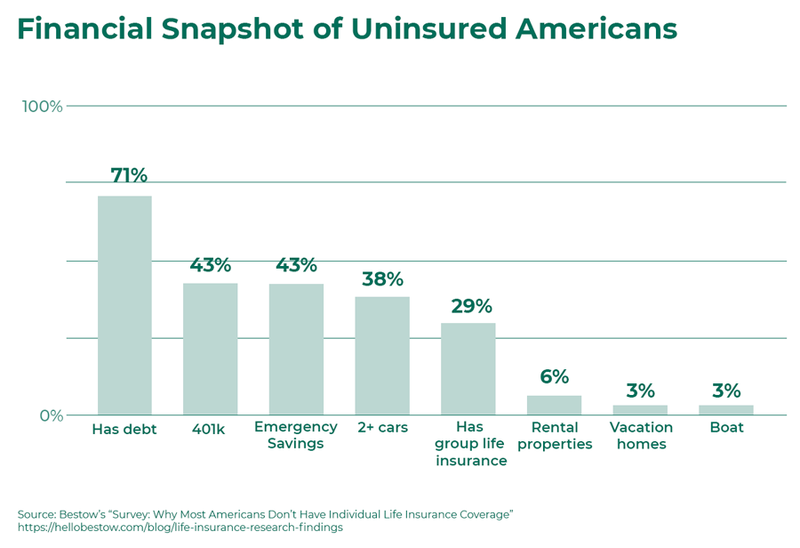 Are Uninsured Americans Financially Prepared for the Future? 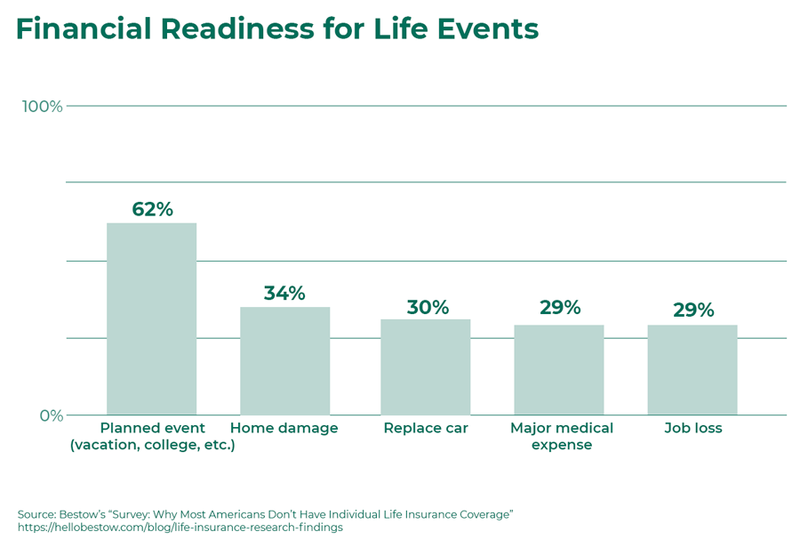 While 88% of Americans agree that long-term financial security is a top priority for themselves and their families, only 27% feel financially prepared for ensuring their family’s long-term income should they unexpectedly die. Overall, we found a little more than half are financially prepared for the fun stuff. 62% struggle to prepare financially for positive life events (buying a car, budgeting for a vacation, saving for college funds, etc.). People want life insurance coverage, but the means to get it no longer works with the way today’s consumers shop. The high cost, invasive and time-consuming medical exams, and the lack of online purchase options have resulted in a coverage gap that has left millions of American families financially vulnerable. 71% currently have debt. The average amount is $54,654. The survey was conducted online in November 2017 in the U.S. The survey included 1,123 respondents, of which 636 were qualified respondents. This study is not based on a probability sample, and therefore no estimate of theoretical sampling error can be calculated. Questions about our survey? You can reach us at team@hellobestow.com. Bestow uses the latest technology, including big data and algorithmic underwriting, to address all of the above reasons why Americans don’t have life insurance. Our entire life insurance shopping process is online and instant — just fill out a simple form. There’s no medical exam, and it’s affordable. A healthy 25-year-old female can get coverage for as little as $2.50 per month. Plus, we’ve partnered with two of the largest industry giants with A+ ratings in financial strength. Apply for coverage today.